THEY are Hong Kong's elite counter-terrorist team - the Special Duties Unit. Aka - the 'Flying Tigers". Recently they were deployed not to deal with terrorists or dangerous criminals but to demonstrate their capabilities to Consular Corps members whose leaders will be in Hong Kong at the end of the month to witness the territory's change of sovereignty, and to strengthen the international community's confidence in post-Colonial Hong Kong's ability to deal with terrorism. Indeed, members of the international community through their Consular representatives were again assured by the Commissioner of Police Eddie Hui Ki-on that the Force will continue its fight against international terrorism after the handover. Mr Hui made the remarks to more than 20 Consular representatives before the Special Duties Unit demonstration at the Police Tactical Unit Headquarters. "I wish to take this opportunity to state clearly our commitment in the fight against international terrorism. The Force's counter-terrorist unit - Special Duties Unit - provides an effective response to any such threat,"he said. "The team is highly trained, well-equipped and consists of the best and the brightest. Its well-developed strike capabilities have earned it a solid international reputation and the SDU is held in high regard by its overseas counterparts. "With the impending change of Hong Kong's sovereignty, I hope to stress that our determination to fight against international terrorism will remain unchanged after 1997." The operations began with helicopter deployments of assault teams onto the roof of a building as part of the Unit's emergency response. Wearing dark balaclavas over their heads, gas masks, bullet resistant vests and brandishing high-powered machine guns, pistols, and combat knives, the "Flying Tigers" launched their assault. The Unit is trained to strike strongholds like buildings, ships, aircraft or trains and can operate on land, sea or in the air. Members of the Consular Corps took a closer look at climbing and absailing techniques of the "Flying Tigers" outside the Close Quarter Battle House, while demonstrations of close quarter engagement and hand-to-hand combat skills were held inside the CQBH. There was also an equipment display. Consular representatives were then taken to the 100-metres range to see for themselves the shooting skills of snipers (who serve as the eyes and ears of the SDU), as well as assault personnel who deployed explosive distraction devices. "The Consular Corps representatives were impressed by the professionalism, stealth and skill of the SDU. I believe they found the presentations interesting and informative," said the SDU's Chief Inspector Danko Au Yeung Chiu-kong. "Our Unit will be on full standby during the farewell and handover ceremonies as well as over the whole transition period. We will closely co-operate with the VIP Protection Unit to ensure the best protection for Internationally Protected Persons (IPPs) and will be ready for any emergency situation." 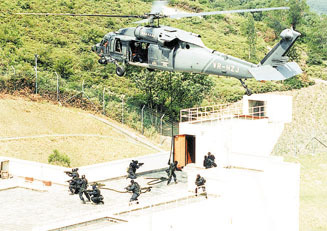 Based at the Police Tactical Unit Headquarters in Fanling, the SDU was set up in 1974 as a Government response to the ever-increasing threat of international terrorism. The first "Flying Tigers" used existing Force weaponry and devised their own tactics. An appraisal of the Unit by the British Special Air Service in 1978 led to considerable changes in equipment and tactics. Since then, the SDU has developed its own comprehensive training programmes and facilities and holds regular training exercises in Hong Kong with similar, overseas units. Officers are also sent on two-week overseas exchanges. Twenty years ago, the SDU was a small force of volunteers. Today, it consists of over 120 officers. Few police forces in the world can field a counter-terrorist unit as highly trained, prepared and equipped. "I send my very best wishes to all in the Royal Hong Kong Police Force on this eve of Hong Kong ceasing to be a British Colony. It has been a great privilege to have been your Honorary Commandant General, and I look back with pride on your singular achievements over the years. You have a proud history and I know that you will continue to serve Hong Kong in the best tradition of the Service.